← Birthday Cake Froot Loops!! For me, there are a number of video games that I often find myself reminiscing about because something has triggered a pleasant memory that is attached to them. Most of these games are old, played in my youth, that I have never gone back to replay. One of the most prominent in my memory is Illusion of Gaia, the middle child of an SNES trilogy by Quintet. Though it’s not your typical middle child. Gaia was far better known than its older brother, Soul Blazer. And its younger sibling, Terranigma, was never formally released in North America. Gaia’s notability is mostly in the fact that it was published by Nintendo, and as such was pushed rather heavily in Nintendo Power. Yet despite this, its siblings seem to be talked about much more often by retro game enthusiasts. Soul Blazer has been christened a hidden gem, and Terranigma’s cachet is being one of those SNES RPGs we never got, which automatically makes it more sought after in the age of the internet. And so, good ol’ Illusion of Gaia often gets forgotten these days, because it was the one of the three that wasn’t forgotten in its own time. But I haven’t forgotten it. I mean, obviously. In fact, it’s spent a lot of time in my active thoughts in the 20+ years since I first played it. A game that left a lasting impression on my impressionable young mind. Most of this, I attribute to the fact that it was a fantasy RPG that used famous locations from the real world, and had a rather mind-blowing plot twist at the very ending. And so, since these elements were burned into Li’l Ryan’s brain, any time they come up in real life, they trigger memories of Illusion of Gaia. Only recently did I finally put aside some time for a replay of Gaia. As it turns out, I had forgotten many facets of the game in the intervening years. Most of the game, actually! There were certain setpieces that I recalled, but for the most part, it was all very unfamiliar to me. Even the general plot was lost on me. Sure, I remembered that life-changing ending twist, but what set off the evens of the game and pretty much everything up until the very end were “new” to me. Something that wasn’t a surprise was the gameplay. A fairly typical action RPG, you control a young man named Will, and go on an adventure around the world. Along the way, you’ll visit many towns, where the bulk of the plot happens, and then a number of dungeons that contain all the action. Illusion of Gaia goes a long way to simplify the formula, however. For example, every level-up is a pre-set bonus to either your HP, attack, or defense. These level-ups are not earned by collection experience points, but rather by eliminating every enemy in a given room. It breaks tradition, but it works very nicely. You still get your character growth and a reason to engage monsters, but it results in zero grinding. Enemies don’t even respawn as long as you don’t leave and re-enter the dungeon. Throughout the course of Will’s journey, he will also gain the ability to transform into the dark knight, Freedan, and a being made of pure energy known as Shadow. Swapping between these characters and taking advantage of their unique abilities are key to overcoming the challenges of each dungeon. Another thing that makes this game unique is that it is incredibly linear, in a time where RPGs were expected to let you off the leash and explore their worlds at your leisure. In fact, in most cases you can never return to an area that you’ve visited once you’re done there. This makes it a little harder to collect all 50 Red Jewels in the game, as roughly 40 of them can be lost forever, but you really only need 30 for any tangible benefits. They can be tricky to find, too, and I absolutely recommend coming equipped with a guide to avoid wasting time examining every jar and wall in every town. 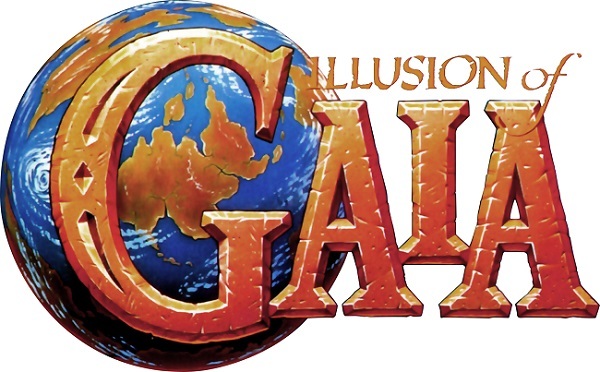 While the gameplay is engaging and the story does interest, what really drove my attraction to Illusion of Gaia was its use of real-world locations, even if they took some artistic liberties. Dungeons are based on real-life temples, archaeological sites, and wonders of the ancient world, like the Incan ruins, the Hanging Gardens of Babylon, the lost continent of Mu, Ankor Wat [sic], and the Great Pyramid of Giza, among others. Though the idea of Mu has been rejected by modern science, and the final dungeon takes place in the probably-fictional Tower of Babel from the Bible. These places all ignited my interest in the history of humanity and our world, and that remains true to this day, even if said interest has waned over time. The one inclusion that still really lights a fire in my heart to this day is when Will and friends make a brief stopover at the Nazca Lines. Only the Condor is shown in the game, but there are a great many shapes in the real-world site, and I am positively in love with the speculation and theories that surround the mysterious drawings. Of all the amazing things on our planet, the Nazca Lines are at the top of the list of things I’d like to actually see before climate change destroys them. Alas, it will never happen, as I am very poor, and the tour alone costs an unimaginable $700. Anyway, video games! They’re usually great, but even the best have flaws. Illusion of Gaia is a far cry from the best, and it’s got a number of flaws. First of all, the translation is a bit shoddy. It could use some touching up, for sure. I actually found it a little hard to follow the narrative at points, the grammar is often poor, and I’m certain that at certain points, the font colour does not properly match the character who is speaking (Though the fact that each main character has their own font colour is a nice touch. Something I would do.). Also, while the dungeons are all very diverse and each one has its own gimmick that is actually fun more often than not, they do feature a surprising amount of backtracking. Even worse is that a few of them force you to walk all the way back out once you reach the end, and even the few merciful shortcuts aren’t enough to mitigate the tedium. Lastly, some of the story beats have really obtuse event triggers, which can leave you stuck for a while if you aren’t familiar with what to do next. The most egregious example is at one point where you need to look at a letter that is silently placed in your inventory after an event, with absolutely no guidance toward it. You cannot move forward without reading said letter, and it left me wandering around town, talking to the same NPCs over and over for a goo twenty minutes before I finally gave in and checked a walkthrough. So, how did the real Illusion of Gaia match up with my rose-tinted memories of the game? Pretty well, actually, considering how much of it I’d forgotten. It tells a touching tale, filled with adventure, mystery, and even a few instances of sorrow. Even though their dialogue is messy, you’ll come to like the main characters as you journey along with them. The gameplay entertained me throughout, and I actually found that the linearity kept me focused and invested in moving forward through the game. While it does end on a tough boss rush and a crazy powerful final boss (protip: abuse save states! ), it’s an otherwise breezy game that will take you maybe a dozen hours to conquer. It’s got a few rough spots, but overall Illusion of Gaia is a fine game. Not quite top-tier enough to be bundled into the SNES Classic Edition, but certainly something you should check out if you’re a fan of the era and have an open weekend.